Teresa Collins works in close partnership with private clients, interior designers and architects on commissioned rugs, drawing on years of experience and colour expertise to interpret your ideas into rug designs. Commissioning a bespoke rug is a creative collaboration. You can easily have a design tailored to suit your individual style and space. I will personally work with you on selecting the design and advise on colour matching. Colours are expertly chosen to complement your fabric and paint samples from my extensive yarn resource of more than 2000 yarn shades. Specific shapes and sizes can be made, the designs can be rescaled to be smaller or larger and there are a variety of yarns to chose from, including wool, mohair, worsted and silk. For something truly unique, you can commission a bespoke rug, as Studio Teresa Collins will do an entirely exclusive design for you. 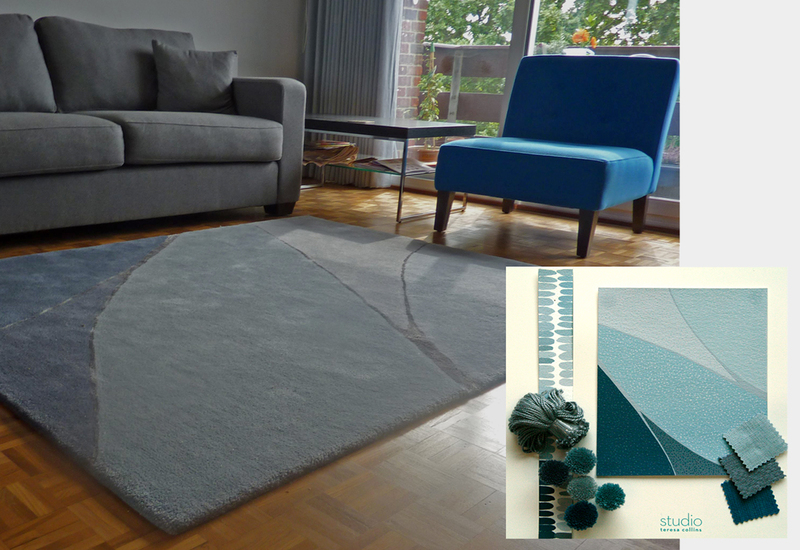 Whether customising an existing design or creating an original one, I am here to offer advice and will design and paint the artwork for this one-off rug. My training as a weaver and years as a leading colour consultant can be seen in every piece. This detailed, sensitive and personal approach captures my design philosophy and carries through into site-specific commissions and limited edition collections. From the design to delivery, I am involved at every step and personally oversee all stages, ensuring the smooth running of projects. I am committed to supporting a traditional textile industry: all our products are made in England, using spinners, dyers and tufters who are extremely skilled craftspeople. I aim to supply within 8 to 10 weeks from a client’s approval, terms are for staged payments, with a 50% deposit paid upon placing the order. Contact me for an initial discussion about your project – or make an appointment for a professional design consultation – I’d love to hear from you.